Tests of Significance Section 10.2. Tests of Significance Used to assess the evidence in favor of some claim. Example: Test sweetener in cola to see if. 2 Tests of Significance Used to assess the evidence in favor of some claim. Example: Test sweetener in cola to see if it loses its sweetness over time. 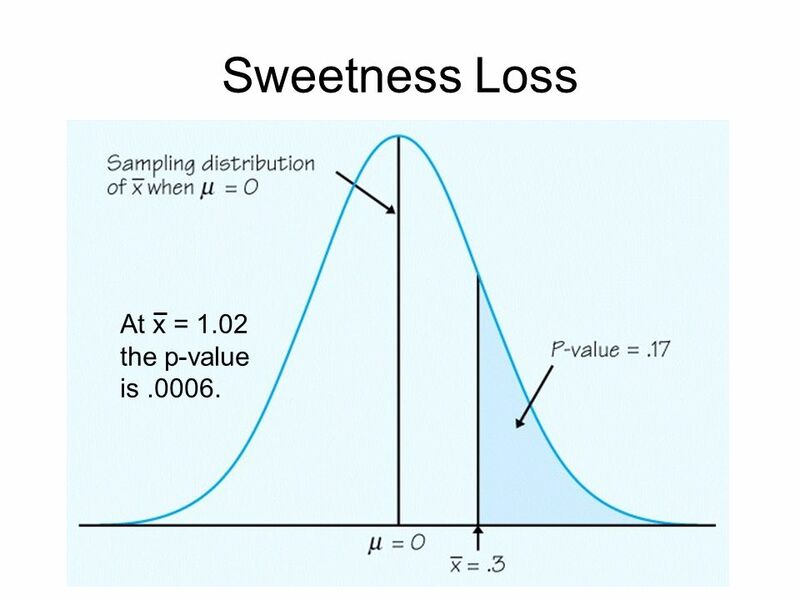 Positive # means loss of sweetness. Results of ten tasters: 2.0, 0.4, 0.7, 2.0, -0.4, 2.2, -1.3, 1.2, 1.1, 2.3 X = 1.02. 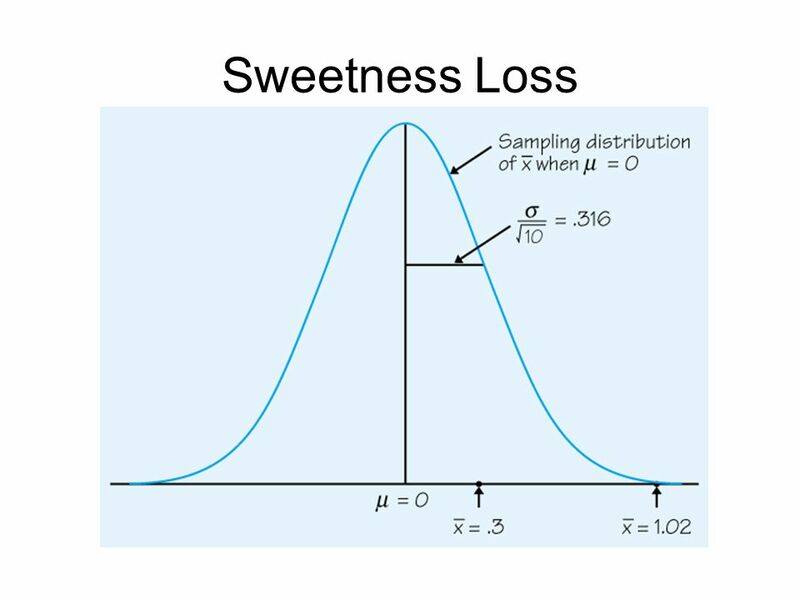 Is this really loss of sweetness or just chance variation? Suppose we know that σ = 1. 4 At x = 1.02 the p-value is.0006. 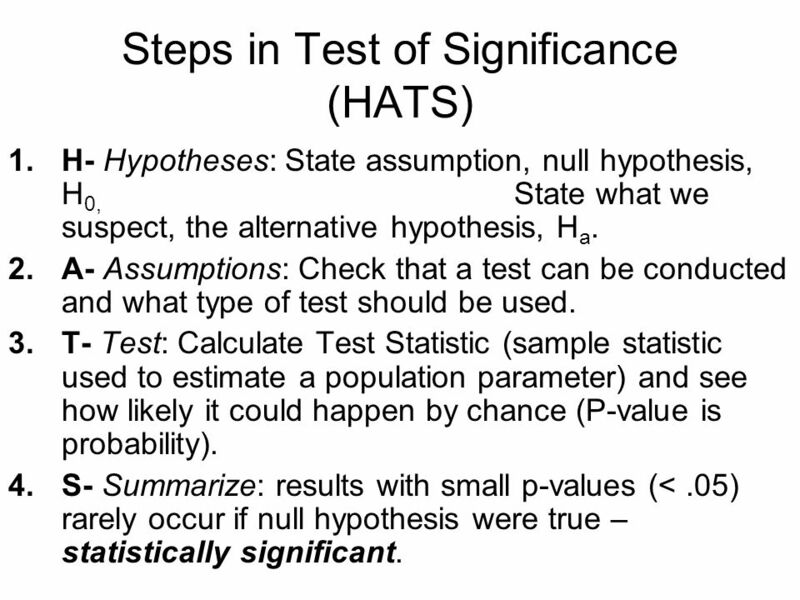 5 Steps in Test of Significance (HATS) 1.H- Hypotheses: State assumption, null hypothesis, H 0, State what we suspect, the alternative hypothesis, H a. 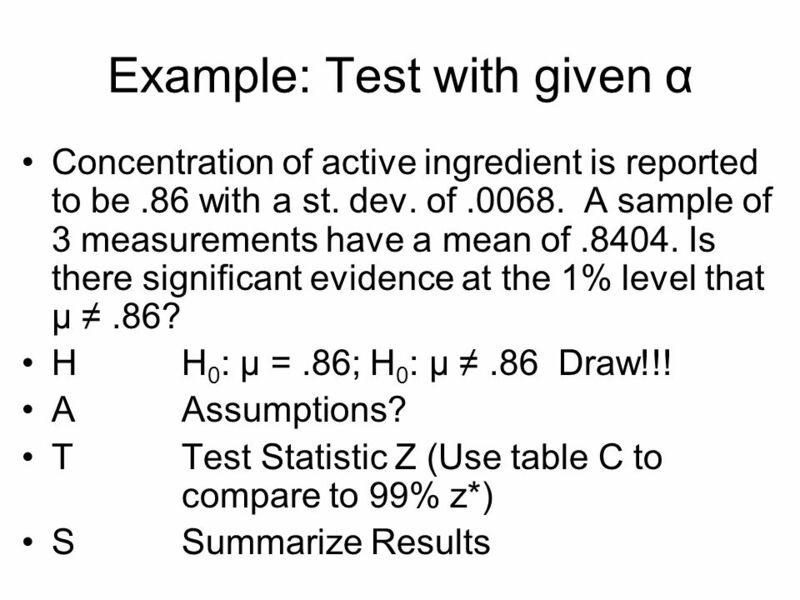 2.A- Assumptions: Check that a test can be conducted and what type of test should be used. 3.T- Test: Calculate Test Statistic (sample statistic used to estimate a population parameter) and see how likely it could happen by chance (P-value is probability). 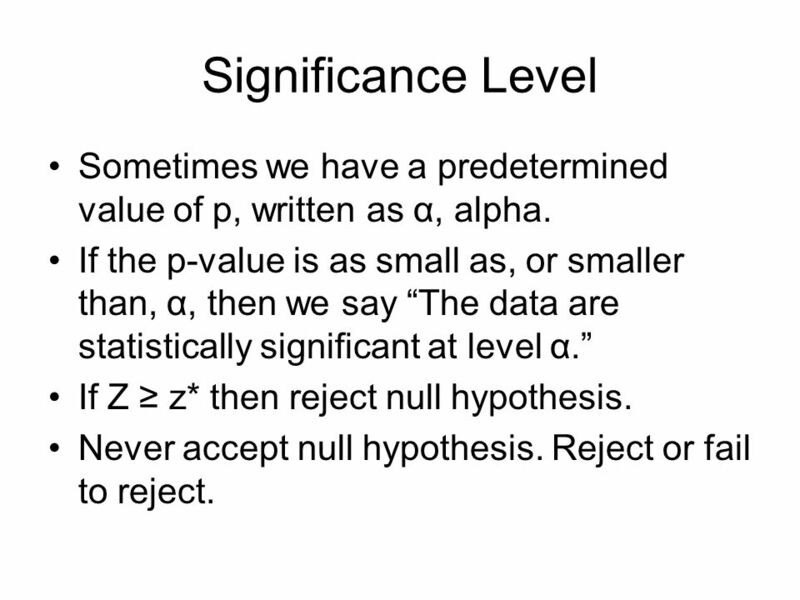 4.S- Summarize: results with small p-values (<.05) rarely occur if null hypothesis were true – statistically significant. 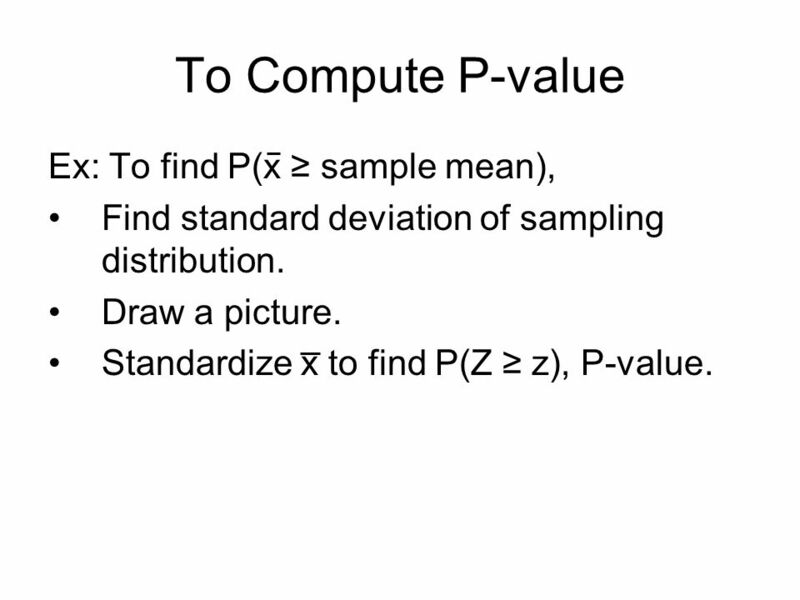 6 To Compute P-value Ex: To find P(x sample mean), Find standard deviation of sampling distribution. Draw a picture. 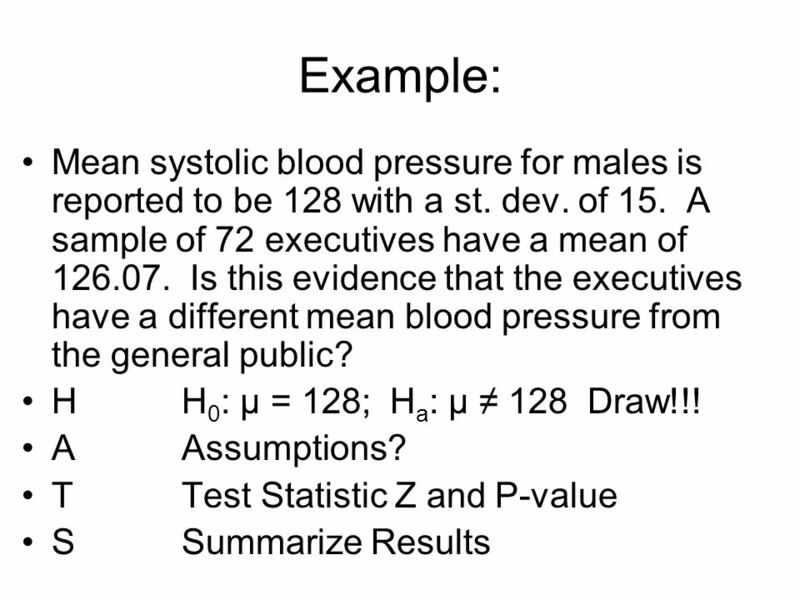 Standardize x to find P(Z z), P-value. 7 To compute the z Test Statistic z = (x - µ 0 ) / (σ/n) If H 0 : µ = µ 0 –H a : µ > µ 0 find P(Z z) –H a : µ < µ 0 find P(Z z) –H a : µ µ 0 find P(Z z) or P(Z z) Draw each situation. 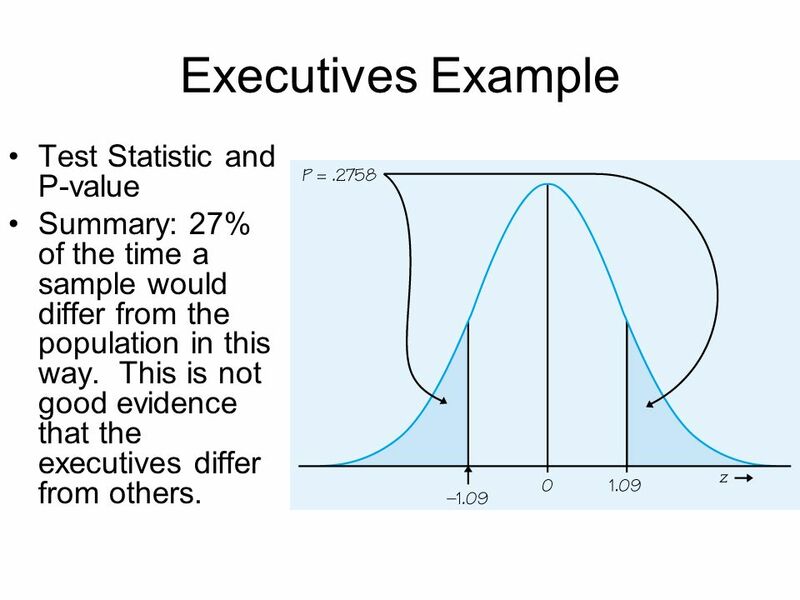 9 Executives Example Test Statistic and P-value Summary: 27% of the time a sample would differ from the population in this way. This is not good evidence that the executives differ from others. 10 Significance Level Sometimes we have a predetermined value of p, written as α, alpha. If the p-value is as small as, or smaller than, α, then we say The data are statistically significant at level α. If Z z* then reject null hypothesis. Never accept null hypothesis. Reject or fail to reject. 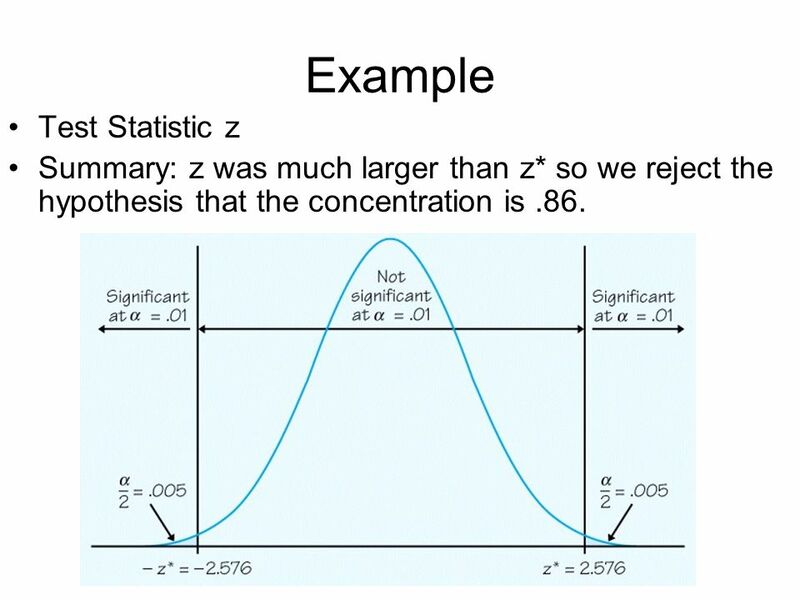 12 Example Test Statistic z Summary: z was much larger than z* so we reject the hypothesis that the concentration is.86. 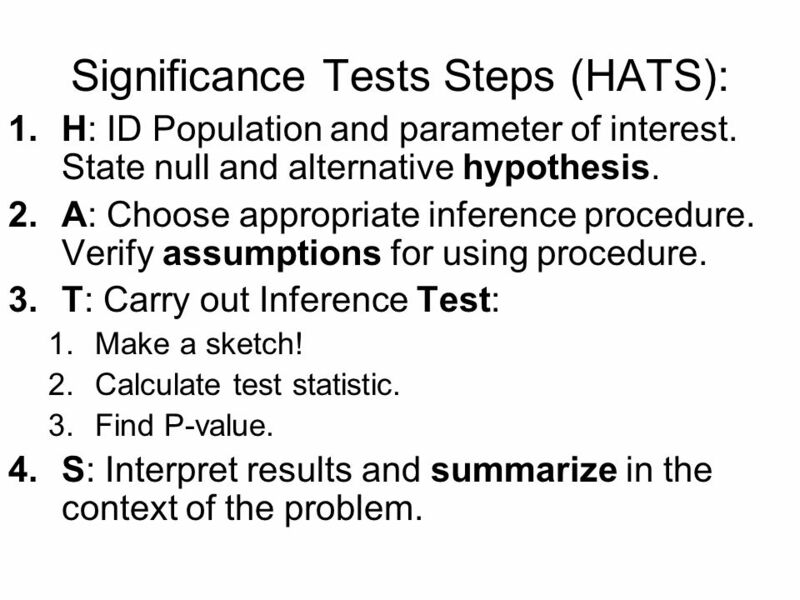 13 Significance Tests Steps (HATS): 1.H: ID Population and parameter of interest. State null and alternative hypothesis. 2.A: Choose appropriate inference procedure. Verify assumptions for using procedure. 3.T: Carry out Inference Test: 1.Make a sketch! 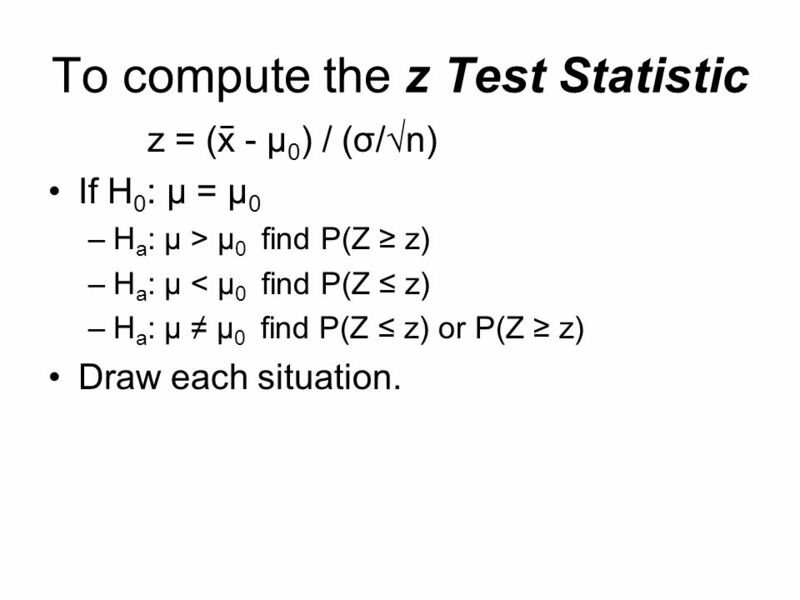 2.Calculate test statistic. 3.Find P-value. 4.S: Interpret results and summarize in the context of the problem. 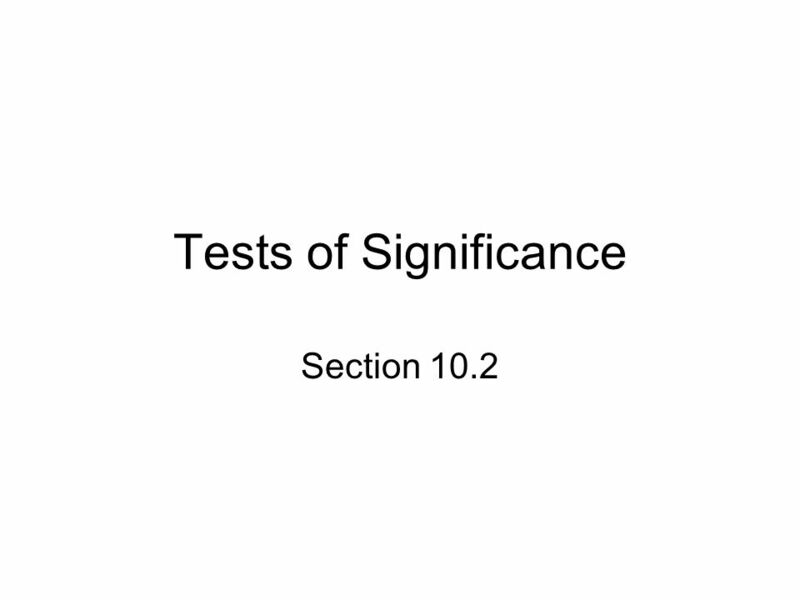 Download ppt "Tests of Significance Section 10.2. Tests of Significance Used to assess the evidence in favor of some claim. Example: Test sweetener in cola to see if." Testing a Claim Chapter 11. Tests of Significance Chapter 11. Confidence intervals are used to estimate a population parameter. Tests of significance assess the evidence provided. Our goal is to assess the evidence provided by the data in favor of some claim about the population. Section 6.2Tests of Significance. 9.2a Tests about a Population Proportion Target Goal: I can check the conditions for carrying out a test about a population proportion. I can perform a. Chapter 9 Tests of Significance Target Goal: I can perform a significance test to support the alternative hypothesis. I can interpret P values in context. + Chapter 10 Section 10.4 Part 2 – Inference as Decision. 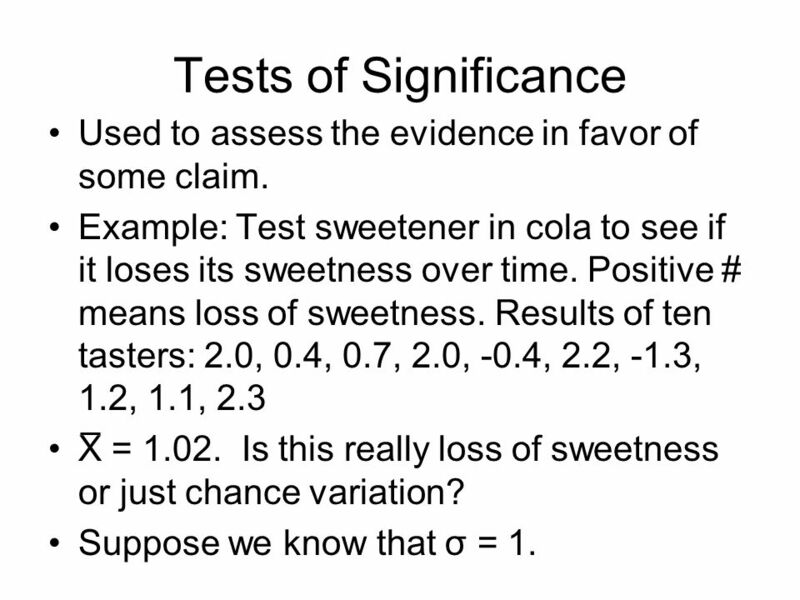 Hypothesis Testing Steps of a Statistical Significance Test. 1. Assumptions Type of data, form of population, method of sampling, sample size. We looked at screen tension and learned that when we measured the screen tension of 20 screens that the mean of the sample was We know the standard. Lesson Carrying Out Significance Tests. Vocabulary Hypothesis – a statement or claim regarding a characteristic of one or more populations Hypothesis. BPS - 3rd Ed. Chapter 141 Tests of Significance: The Basics. + Chapter 9 Summary. + Section 9.1 Significance Tests: The Basics After this section, you should be able to… STATE correct hypotheses for a significance. The Practice of Statistics, 5th Edition Starnes, Tabor, Yates, Moore Bedford Freeman Worth Publishers CHAPTER 9 Testing a Claim 9.2 Tests About a Population.